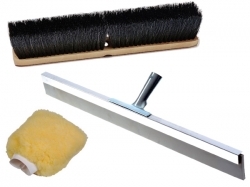 NLS Products distributes a variety of cleaning supplies from mops, to brooms, chamois and squeegees. NLS Products distributes high quality products and supplies across Canada for various markets including auto, farm, hardward, industrial, retail, marine, construction and trucking. Various products including brooms, mops, brushes, rags, squeegees, chamois, mitts and handles distributed by NLS Products in Canada.